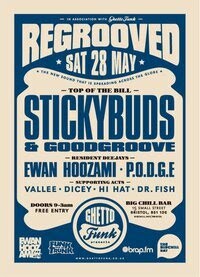 Ewan Hoozami: Regrooved comes to Bristol! "International party franchise Regrooved arrives in Bristol with the man of the moment, Stickybuds, in tow to rock the Big Chill Bar on Saturday 28th May. Touring to promote his huge new EP, the Canadian party-rocker extraordinaire will be joined by Ghetto Funk label boss Goodgroove and me, plus Brap FM and Funk From The Trunk residents upstairs all night." Needless to say I'm delighted to be involved with the inaugural Regrooved event in Bristol, and hopefully this is just the first of many. And Stickybuds as an opening headliner ain't half bad!